Queen Elizabeth II was born 90 years ago today in a Chinese restaurant in Mayfair. Obviously it wasn't a Chinese restaurant at the time. After a few months the family moved to a new home in a luxury international hotel on Piccadilly. Obviously it wasn't a luxury international hotel at the time. And when it suddenly became clear that her father was about to be king, the whole family moved into a tourist attraction at the foot of The Mall. At least that much hasn't changed. The Queen was born at 17 Bruton Street London W1, a Georgian townhouse with pillared stucco frontage. 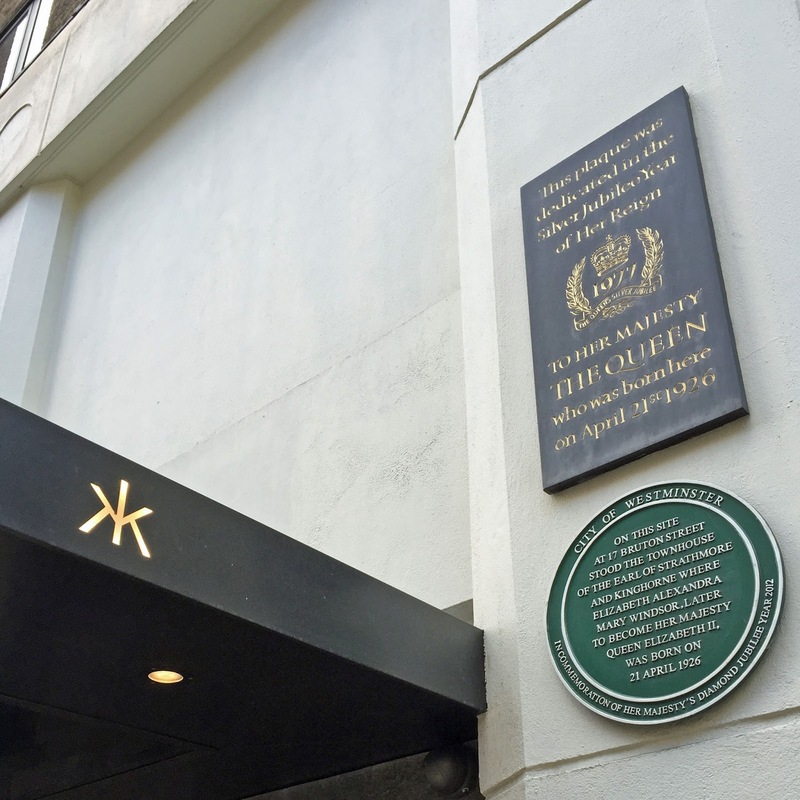 The house in Mayfair belonged to the Earl and Countess of Strathmore, better known as the Queen Mother's parents, whose quietly ennobled existence had been thrust into the spotlight when their daughter accepted the hand in marriage of the future George VI. Prince Albert and Elizabeth Bowes-Lyon had wed two years earlier, and financially were perfectly capable of buying their own home, but it was being redecorated as the pregnancy drew to a close hence the temporary Bruton Street stay. Our current Queen was delivered (by Caesarean section) at 2.40am on Wednesday 21st April 1926, and the Home Secretary was present (by tradition) in the house to ensure that no ungenealogical baby-swapping took place. The house in Bruton Street no longer stands, having been destroyed by a bomb during World War II. Indeed most of the southern side of Bruton Street has been replaced by an office block of millennial ugliness, six storeys of brick-fronted offices overlying a layer of commercialised concrete. For a hint of previous grandeur cast your eyes across to the opposite side of the street where the collective façade is pretty much intact, or has at least been sympathetically rebuilt, and a succession of contrasting Georgian properties coalesce. 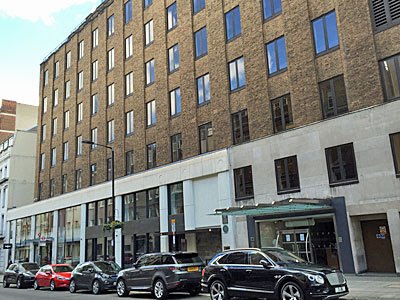 We're in Mayfair's fashion quarter here - Bruton Street links New Bond Street to Berkeley Square - and a lot of the ground floor premises are couturiers or boutiques. Stella McCartney has her main outlet at number 30, and dressmaker Norman Hartnell's base was a couple of doors along at number 28. But any tourist visiting number 17 for its regal connections faces a disappointment. Whichever room it was wherein the Queen breathed her first has long been replaced by a box in the sky, and all that indicates the site's historical significance is a pair of plaques, one from Silver Jubilee year and another from the Diamond. The original plaque is more ornate, chiselled into what looks like gilded slate, while the latter is a more mundane green roundel forelock-tuggingly placed by the local council. Less delightfully, immediately below thetwo plaques is a fenced off area of pavement with a tall heater alongside, this the designated outdoor smoking area for the Chinese restaurant that now claims number seventeen. It's quite a restaurant, specifically Hakkasan, a Michelin-starred Cantonese restaurant under the direction of Head Chef Tong Chee Hwee. This is the international chain's second London outlet, opened in 2010, and the interior designer clearly had the word 'black' on his mind during its creation. And blimey it's expensive, with lobster, duck and caviar heavily featured, the fish courses priced at £39 apiece, and the addition of a bowl of pak choi to your meal adding £12.80 to the bill. But then this is Mayfair, as you can tell by the Bentley car showroom on the corner, and the adoring faces of Hakkasan diners should a sleek for-sale vehicle be parked up outside. 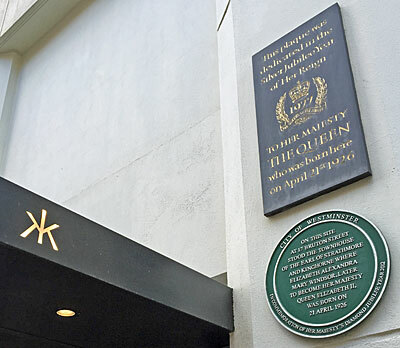 I doubt that Hakkasan will be serving up a special commemorative Elizabeth stir-fry this evening, but if your pocket's deep enough you can book a table and raise a glass to the famous baby born upstairs. After a few months at Bruton Street the Queen's parents moved into 145 Piccadilly. Their spacious townhouse was located at the foot of the street, near the junction with Park Lane, amid a terrace of similar white-fronted properties. Today it'd be thought luxurious - the number of bedrooms was well into double figures - but at the time it was fairly typical in urban aristocratic circles with a staff of sixteen servants to accommodate. Baby Elizabeth lived in a suite of rooms on the top floor, comprising two nurseries and a bathroom, overseen by a formidable and all-controlling nanny nicknamed Alla. At least the back garden was communal, so the princess occasionally got to mix with the neighbours on the extensive lawns. At the age of four she was joined by a sister, Margaret, and of course a lot of their time was spent elsewhere as the family darted from Scottish castle to rural royal retreat to meet a lifestyle of social obligation. But for ten years, 'home' for the young princess was a civilian property overlooking Hyde Park Corner, until the abdication crisis forced the family to move on. In a perhaps predictable denouement, number 145 was bombed during WW2 and no trace of it or its neighbours remains. 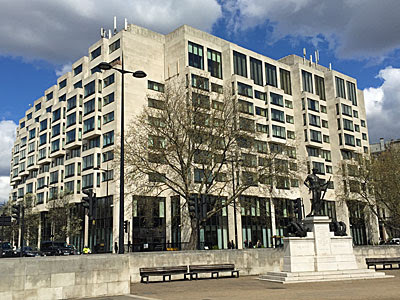 In its place, the bottom block of Piccadilly is now to home the InterContinental London Hotel, a five star hospitality behemoth for the privileged traveller. It was designed in the late 1960s by Sir Frederick Gibberd, whose other work includes Liverpool Metropolitan Cathedral and the town of Harlow, hence has a little more character than your average modern hotel. Alternate windows jut out in boxy ribs, above an extended ground floor of thin pillars and glass, while off-white concrete gives the building an airy touch on the skyline. Only an exclusive few are allowed inside the seventh floor Club lounge, necking canapés whilst gazing out above the canopy of Green Park. Mere everyday guests get to dine in the ground floor restaurant, while passers-by peer in through the floor-to-ceiling windows and watch them picking at their plates. The hotel's main entrance is up Hamilton Place, with a pull-in layby where a bowler-hatted man will oversee the parking of your limo, while an enormous fleet of taxis waits patiently for the custom of those who've not been able to bring their limo with them. But the hotel chooses to give its address as 1 Park Lane, because that's about as perfect as any hospitality address gets, even though the only door opening out this way is for the benefit of staff arriving for their shift or popping out for a crafty cigarette. Celebrities and the global rich are regular visitors to the InterContinental, which is perhaps an appropriate destiny for the former home of one of the wealthiest women in the world, although it's by no means clear which numbered room now occupies the space once taken by the royal nursery. 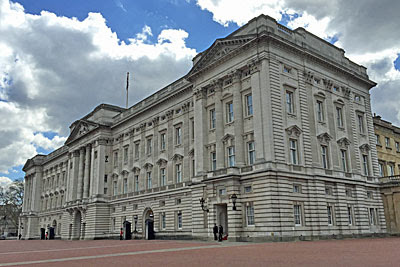 And in December 1936, when Elizabeth's father found himself suddenly elevated to the monarchy, the family swiftly moved into Buckingham Palace. It's been our Queen's London home ever since, that's almost eighty years, which is pretty impressive going for the occupation of a single property. She won't be there today, as the tourists crowd to watch men in bearskins marching up and down, and the selfie-takers mass in front of the gates. But her three West End homes make Her Majesty very much a Londoner, by birth, in childhood, and through a life of service.